Mitch Jayne came up with the fact that as there were two Dillards in the group, to call the band The Dillards. Doug, Rodney and Dean wrote and practiced songs daily on the back porch of Mitch's house. The Dillards realized immediately that if the band was going to have a shot at success, they would have to offer something different. Live 1962 at Washington University/Missouri. With Doug Dillard, Rodney Dillard, Dean Webb and Mitch Jayne. Car troubles along the way to California damaged the group's fragile financial status and when they arrived in Oklahoma City they were nearly flat broke. At the "Buddhi Club" in Oklahoma City they got a job. This was the first time the band was together for their first professional road show. After a very successfull week at the "Buddhi Club" the band had the money to finish the trip to California. After arriving in Los Angeles, it was November 1962, the boys landed at the door of the "Ash Grove", a popular hangout for poets, beatniks, folk singers and bluegrass musicians. 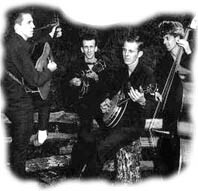 Appearing that night was a New York-based bluegrass band, "The Greenbriar Boys". The Dillards struck an immediate friendship with the "Greenbriar Boys" and the two bands were jamming on stage. Seated in the audience that night was Jim Dickson, a talent scout and producer for Elektra Records. 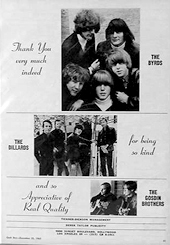 Dickson who produced such musical acts as The Byrds, was duly impressed by the novel sound of the Dillards. (Dean Webb arranged the harmony vocals of the Byrds' "Mr. Tambourine Man"). The next night the Dillards had their first recording contract. "The Dillards have a drive and enthusiasm that shine through the hard, sparkling brightness of their music. They call it "Back Porch Music" and they enjoy the making of it so obviously that the listener finds himself caught up and carried away. On this album you will find mountain songs, play-party songs, dance tunes and breakdowns from the Ozark region, plus original material based on the tunes indigenous to the boys' home territory. If in listening to this album you find yourself ruminating on bygone times, sensing perhaps the musical feeling and creativeness of your ancestors long since finished with their part in the making of America, if you get the feeling of the campfires and the log cabins and the lonely candlelight burning in the wilderness, you will have amply rewarded the Dillards." The song " Reuben's Train" from that album was released 1970 on the compilation album "Folk Festival" on Legacy records (LEG 110) and on "Hootenanny" released by Elektra/Crestview (CRV-7806). Note: "Back Porch Bluegrass" and "Live...Almost" were released 2001 on one CD by Elektra (8122 73562-2). 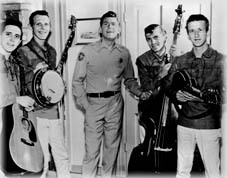 During the same time Richard Linke, associate producer of "The Andy Griffith Show" contacted Elektra Records management and arranged to audition the band. 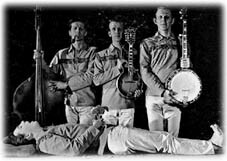 After playing half of a tune they offered the Dillards a job as The Darling Boys, a musically-inclined mountain family. The Dillards started writing songs together because they felt it was extremely imortant to develop and perform their own material. Whenever possible, Griffith allowed the Dillards to perform their own material on the shows. The Dillards also appeared at the "Judy Garland Show" and a few TV shows with "Tennessee Ernie Ford". The same year the Dillards also played at "The UCLA Folk Festival", "The Monterey Folk Festival", "New York's Folk City" and "The Newport Folk Festival". The same year Jim Dickson asked the Dillards to help him on an instrumental project with Glen Campbell on the 12 string guitar. Jim Dickson called the group "THE FOLKSWINGERS" and they recorded folk and bluegrass songs. Both albums with Doug Dillard, Rodney Dillard, Dean Webb (on the bass) and Glen Campbell. During 1964 the Dillards and the embryonic Byrds with Gene Clark (Jet Set/Beefeaters) were in the World Pacific Studios in L.A. and were both produced by Jim Dickson. with Doug Dillard, Rodney Dillard, Dean Webb, Mitch Jayne, Chris Hillman on bass, Michael Clarke on drums. "The Dillards go electric to make up bluegrass-rock!" Note: 2007 Sierra Records released the two songs from the "Early L.A." album on the CD Sixties Transition with an additional unreleased track "Someday you'll find" from the same session with Chris Hillman and Michael Clarke. Other artists on this CD are: The Byrds, The Hillmen, The Gosdin Brothers, Leon Russel, David Crosby etc ... all produced by Jim Dickson . One day Doug became a call from Bill Monroe and he asked Doug to play a show with him. Bill's bus had broken down and Bill had come to Los Angeles by himself, he left his banjo picker and everybody else behind. So Doug went and played the college at San Diego with Bill Monroe. The Dillards owed Elektra one final album. 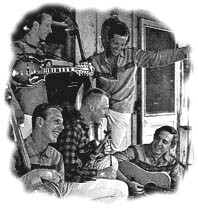 The group decided to demonstrate to the bluegrass elite that the Dillards could play the old-fashioned style because the band experimented with electric instruments and occasionally added drums, like drummer Dewey Martin for a road trip. This time the Dillards were not playing bluegrass festivals, they were doing the rock and roll circuit with groups like "Sam the Sham", "Mitch Ryder and the Detroit Wheels" and "The Byrds". Jim Dickson had arranged for the Byrds and the Dillards to travel cross country together on a thirty-stop tour. Both bands recorded at World Pacific Studio and were friends. (Dewey Martin was hired after a tour from Stephen Stills and formed with future legend Neil Young "Buffalo Springfield"). Rodney approached Elektra Records about the possibility of doing an instrumental album and received the go-ahead. 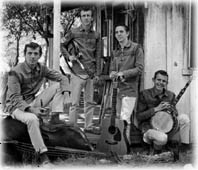 The Dillards third album featured an addition to the band, fiddler Byron Berline (at this time 19 years old), who had met the Dillards at a college concert in Norman, Oklahoma. With Doug Dillard, Rodney Dillard, Dean Webb, Mitch Jayne and Byron Berline. This album, strictly instrumental, was indeed a dramatic departure from the Dillards' previous efforts as the fiddle was prominently emphasized in tunes. Note: The label on the disk and the album cover notes, do not correspond with the actual track appearance on the record! Note 2004 "Elektra Records" has released a double CD including three Dillards albums and two singles: "Pickin' and fiddlin'" with Byron Berline, "Wheatstraw suite" and "Copperfields" and 2 singles as bonus tracks which were recorded for "Capitol Records" in 1965. After that album the Dillards had left the Elektra label and signed a contract with Capitol Records. The Dillards cut several sides with different producers and never found any continuity and so they never finished an album for Capitol and returned to Elektra Records. With Doug Dillard, Rodney Dillard, Dean Webb, Mitch Jayne and Dewey Martin. Note: "Last Thing On My Mind" was issued on a folk compilation in Spain. Note 2004 "Elektra Records" has released a double CD including those 2 Capitol singles as bonus tracks. This CD contains: "Pickin' and fiddlin" with Byron Berline, "Wheatstraw suite" and "Copperfields" and the two singles. Rodney felt extremely limited by bluegrass and was ready for a radical change, but Doug didn't want to change the rhythm of the music and one day Doug Dillard announced that he was quitting the band. Mitch Jayne's first book "Forest In The Wind" was published in 1966.